By Natasha Bedford, Trainee Ranger, Queenstown. 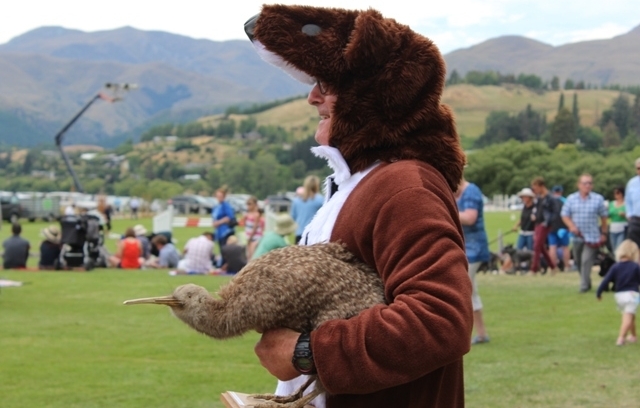 DOC Wakatipu staff and the Wakatipu Reforestation Trust came together recently to promote conservation at the Lake Hayes A&P Show. 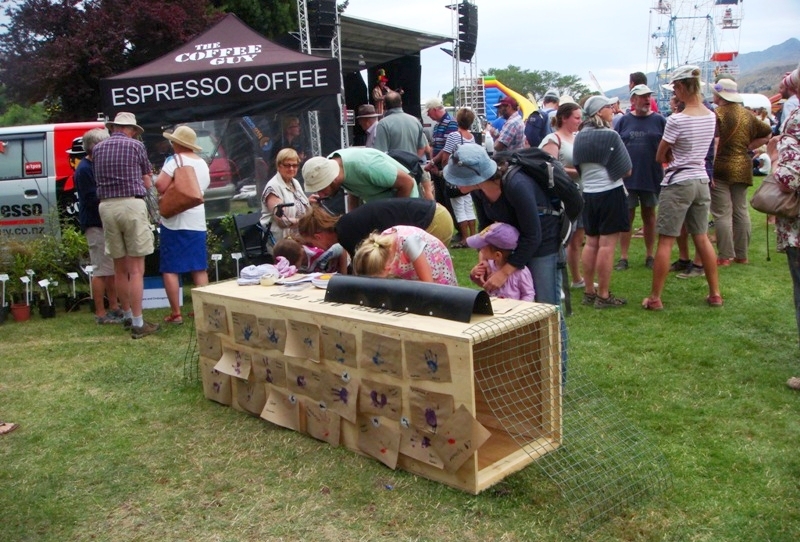 Our stand was themed around the native birds found in the Wakatipu Basin and the work DOC is doing with partners to protect and enhance local native species. Our two key messages were ‘Where have our native birds gone?’ and ‘How can we bring them back?’ which were brought to life with interactive demonstrations. Conservation Services Ranger David Deck showed his commitment to the cause by braving the warm temperatures in a full-length stoat costume. Crawling through a giant tracking tunnel, he left behind ‘stoat footprints’ for the kids to identify, to illustrate how DOC staff track and monitor pest numbers in the bush. Once the ‘stoat’ had shown the way, kids at the show were keen to crawl through the tunnel to locate the hidden lollies—every good tunnel needs bait, after all! Stoat suits and sun don’t go together too well, so Conservation Partnerships Manager Greg Lind and Conservation Service Ranger Owen Hale took over the stoat costume duties to give David a rest. However, David managed to snap a photo with the Topp Twins before he relinquished the costume. 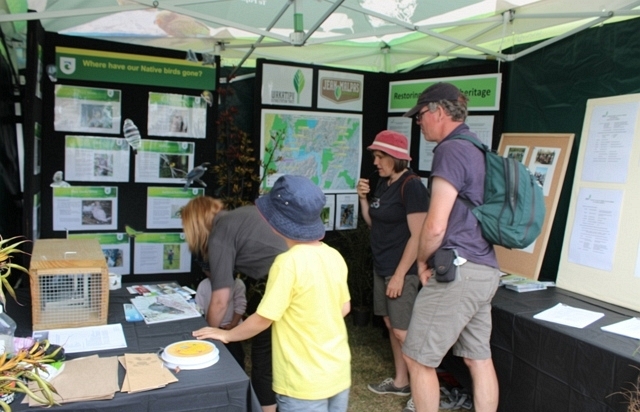 Our partners Wakatipu Reforestation Trust were at the show promoting rare and endangered local plant species. They were also looking to recruit local volunteers, and spent the day helping visitors learn about native plant species and how to bring native birds back to their gardens. 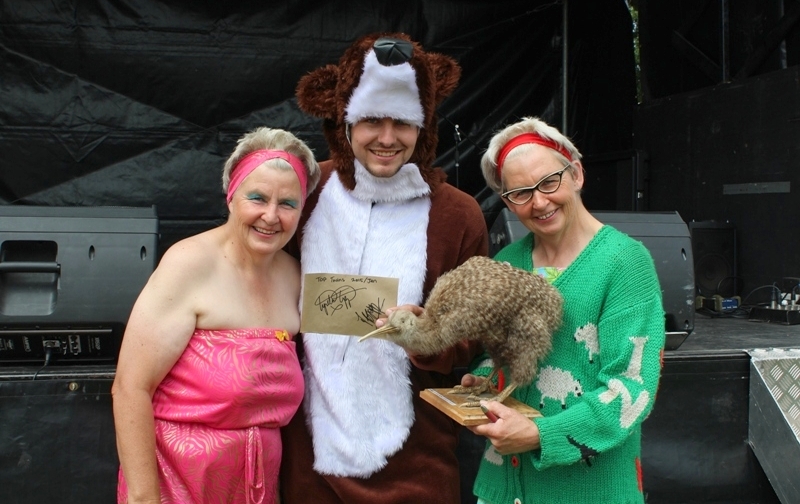 Overall we had a successful and positive day where we engaged with our community to promote conservation in the Wakatipu – and all done while dressed as a stoat!